ARE YOU A SCARY MOMMY? Ever roll your eyes when someone tells you how sweet your child is, and then go off in a tirade that you should see him when he’s tired, hungry, just wakes up, or wants something he’s not allowed to have. Yeah, I didn’t think so. Only a select few are brave enough to tell you how it really is. To proudly say “yes, my kid banged her head on the ground because I wouldn’t let her eat a sticker.” Scary Mommy, author and blogger extraordinaire, is that mommy. Her tell it like it is attitude is anything but scary. Hysterical? YES! Ok, maybe it’s a little scary. Especially for the mommas-to-be who naively took the plunge. No turning back now, momma! Scary Mommy, aka Jill Smokler, started ScaryMommy.com to chronicle her life as a stay-at-home mom. Her simultaneously honest and hilarious take on motherhood quickly transformed her “baby book” into a medium enjoyed by millions every year, including Tori Spelling, Nicole Ricci, Cynthia McFadden, Holly Robinson Peete and President Obama. Scary Mommy also houses Scary Mommy Confessional, a forum where moms and dads can spill their guts in total anonymity. And oh do they ever! Luckily for us, Jill decided to combine her unique take on motherhood with “scary mommy confessions” to pen Confessions of a Scary Mommy: An Honest and Irreverent Look at Motherhood: The Good, The Bad, and the Scary. The book will be released April 3, but don’t let that stop you, preorder it today! It’s great fodder for when you’re kids make you want to pull a Britney, camaraderie for exasperated momma’s everywhere and a nice baby shower gift (giving you license to say “I told you so” when your friend calls you in tears). And it’s AMAZING birth control! So naturally I had to learn more about this inspiring momma. Here’s what she had to say. What was the inspiration behind your blog, Scary Mommy? My kids. Scary Mommy really started simply as a baby book for my youngest. I looked at the terrible baby book I kept for my daughter, the shoe box I stuffed things into for my son and knew this poor third child would have no record at all of his early days. I gave a blog a shot, thinking it might be easier for me to keep up with than a paper version. And, it was. What’s a day in the life of a Scary Mommy like? I’m sure we’re all now wondering if we’ve been afflicted with “Scary Mommy.” What are the symptoms? An inability to fake it, brutal honesty, humor, not taking oneself too seriously and be OK admitting failure. If you could give new mothers one piece of advice, what would it be? Relax! It’s a baby, not an alien. Help us feel better.What’s would you consider to be one of your biggest parenting blunders? Just one? Most recently, I let my boys play in the shower while I took care of some online stuff in the next room. It’s a shower, not a bath, so I figured what damage could they really do? Well, they sat on the drain so that the water collected and spilled out of the sides, causing the ceiling below to cave in. I could hear them giggling and playing, so I assumed all was well until I heard my husband yell that he was covered in water from a floor below. Whoops. 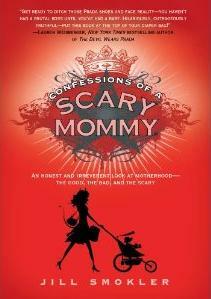 Your book, Confessions of a Scary Mommy , is absolutely hilarious, please tell us you have more in the works. I’m so glad you think so!! And, not yet, but maybe someday. Hopefully someday! I love that you included some of the mommy confessions from your blog in each chapter of the book. What is the most shocking confession you ever heard? Oh, there are so many that have shocked me. The number of people cheating on their spouses always surprises me, but the most surprising to me are the mothers who regret having children. As tough as my days can be, that’s never an emotion I have felt. It must be a really heavy burden to bear. What advice would you give to new mommy bloggers out there? And aspiring authors? To enjoy it. For the first two and a half years of my blog, I didn’t earn a penny yet still treated it like a job. Once it started feeling like a burden, I knew it was time to reevaluate. If you’re doing it for fun, and it stops being fun, what’s the point? And finally, the most important question, the one I ask everyone: After a long day of keeping your kids alive and your sanity intact, what is your favorite drink? Margaritas during the spring/summer and spiked apple cider during the fall/winter. Red wine if I’m desperate. A big thanks to Jill for not only the interview, but also for letting us know we’re not alone! You can get more laughs in at ScaryMommy.com or on twitter @ScaryMommy. And be sure to check out her book ! Leave a comment for a chance to win a signed copy of Confessions of a Scary Mommy, because I know you ALL can’t wait to read it now. And you can check out her tour dates and locations for an opportunity to meet her in person! What are you still doing here?? Go! Reserve a copy ! UPDATE: And the winner of Confessions of a Scary Mommy is … ANNA! Congrats! Great Interview! Sounds like a great book. It always helps to know that other moms struggle day to day. The head butting is brutal! This sounds like it would make a great mummy’s day gift. I really liked the interview! I really want to read this book!